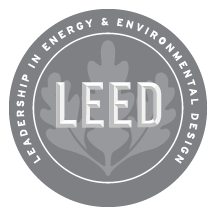 LEED Accredited – Danner Construction, Inc.
As a LEED (Leader in Energy and Environmental Design) contracting company, we prove our commitment to the health of the planet by reducing waste, conserving energy, limiting toxic emissions, and by recycling. At Danner Construction Company we are concerned about the long term future of the planet. As a LEED (Leader in Energy and Environmental Design) contracting company, we prove our commitment to the health of the planet by reducing waste, conserving energy, limiting toxic emissions, and by recycling when possible, all while meeting and exceeding project specifications, costs, and timelines. If your upcoming project is required to meet LEED guidelines, or if you just care about the environment, Danner Construction Company will provide excellence in efficient design and engineering in the most environmentally friendly manner possible.